In the May 20, 2011, report, "Ten Great Public Health Achievements --- United States, 2001--2010," on page 621, preliminary estimates of the impact of public health interventions during the 2009 H1N1 pandemic were presented as follows: "These public health interventions prevented an estimated 5--10 million cases, 30,000 hospitalizations, and 1,500 deaths (1)." These estimates were derived using combined data from two sources: 1) an unpublished CDC model for estimating the impact of the 2009 H1N1 pandemic influenza vaccine on averting cases, hospitalizations, and deaths during the 2009--10 influenza season and 2) a model for estimating the impact of antiviral treatment in averting hospitalizations and deaths during the 2009--10 season (2). As a result of a programming error, the model used to estimate the impact of vaccination did not adequately adjust for the decreasing risk for disease as the pandemic progressed, and thus the impact of vaccination was overestimated. The corrected estimates for the combined impact from vaccine and antiviral treatment are as follows: 713,000 to 1.5 million cases, 12,300 to 23,000 hospitalizations, and 620 to 1,160 deaths averted. Of these, 713,000 to 1.5 million cases, 3,900 to 10,400 hospitalizations, and 200 to 520 deaths were averted as a result of the vaccination campaign (CDC, unpublished data, 2011), whereas the use of influenza antiviral medications is estimated to have prevented another 8,400 to 12,600 hospitalizations and another 420 to 640 deaths (2). The model that they used for the May 20 report was wrong. As they state, it did not take into account decreasing risk of infection as the pandemic progressed. This decreased risk came about for several reasons: people became infected and so were no longer potential hosts; people were immunized and were no longer susceptible to infection; people may have taken extra precautions (covering coughs/washing hands) to prevent infection/spread; communities reached a level of immunity that protected those who had not been vaccinated. Because of the reduced risk of infection as time passed, the impact of vaccinating decreased. resulted in approximately 43 million to 89 million cases, 195,000 to 403,000 hospitalizations, and 8,900 to 18,300 deaths, including 910 to 1,880 deaths among children aged <18 years, during April 2009--April 2010 (3). While we're on the subject, as temperatures drop, the air becomes drier and people start to congregate indoors more frequently, flu season starts to ramp up. Conditions are becoming ripe for transmission of the virus, and hospitals are places where we really cannot afford to spread the flu. There are a lot of individuals whose immune systems are less able to cope with infection, so even illnesses that might be mild in a healthy individual may become life-threatening. Whether the patients are walk-ins or in for long term care, children, adults or the elderly, it is vital for hospital employees to be vaccinated against the flu. I'm not just talking about the doctors and nurses, here. I mean everyone that works in the hospital. At the very least, anyone who spends any amount of time in a patient area (waiting room, exam room, elevators, hallways, stairwells, lobbies) should be immunized if they have no medical reasons to the contrary. Hospitals and their employees should take steps to protect the health and well-being of their patients, and that includes taking measures to reduce the risk of infection. 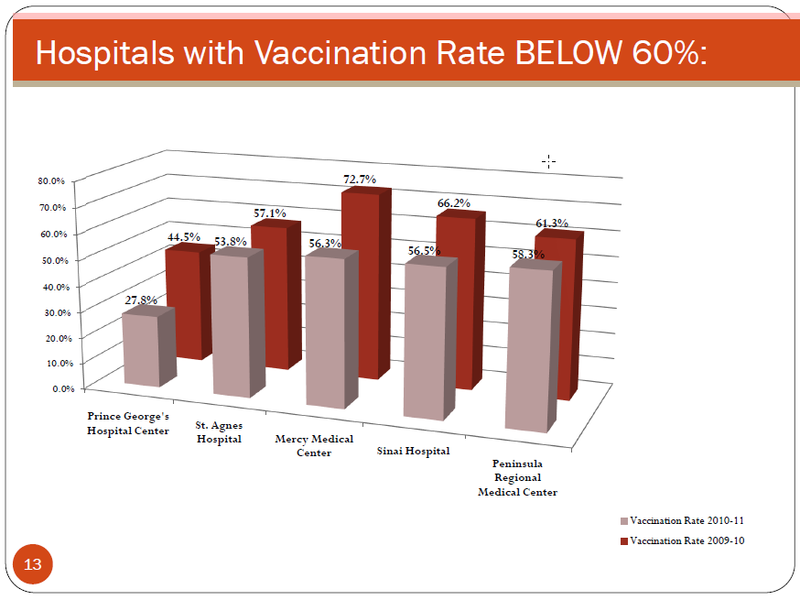 I decided to take a look online to see if I could find any recent reports of vaccine rates among hospital employees and stumbled upon a survey of Maryland Hospital Healthcare Worker Influenza Vaccination (PDF). This was a self-reported, web-based survey of Maryland hospitals looking at total number of employees who received a vaccine, number that exempted out for medical reasons, number that exempted out for religious reasons and number that declined immunization but did not provide a reason, compared to the total number of employees at the hospital. 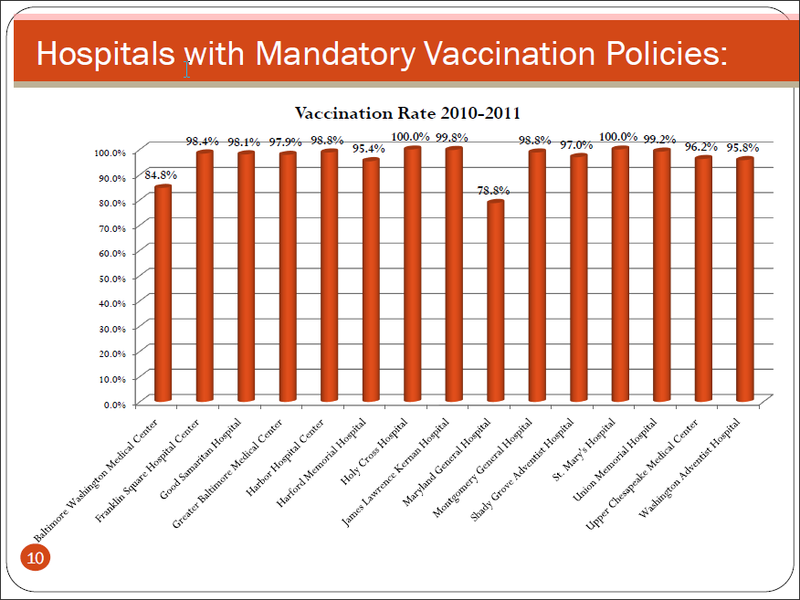 Some hospitals had mandatory immunization policies with consequences for non-compliance (such as loss of privileges or even being fired), some had mandatory policies but no consequences for non-compliance and still others had no vaccination policy. I'm not sure I buy those ones that report 100% rates, though. Statistically speaking, in any given hospital, there ought to be at least one person who opts out, for medical, religious or philosophical reasons. 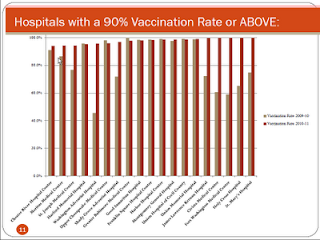 That makes me wonder how honest those hospitals were being when they answered the survey, especially since it doesn't appear there was any protocol in place to verify reported vaccination rates. If they are inflating their success rates, this gives an erroneous and potentially dangerous picture of their infection prevention procedures. Of course, it's always possible that they simply fired anyone who didn't vaccinate, regardless of reason; in that case, of course they'd have 100% compliance, though I imagine it would be a bad place to work. These institutions were probably being quite honest about their own immunization rates, which, sadly, paints them in a rather negative light when it comes to protecting their patients. 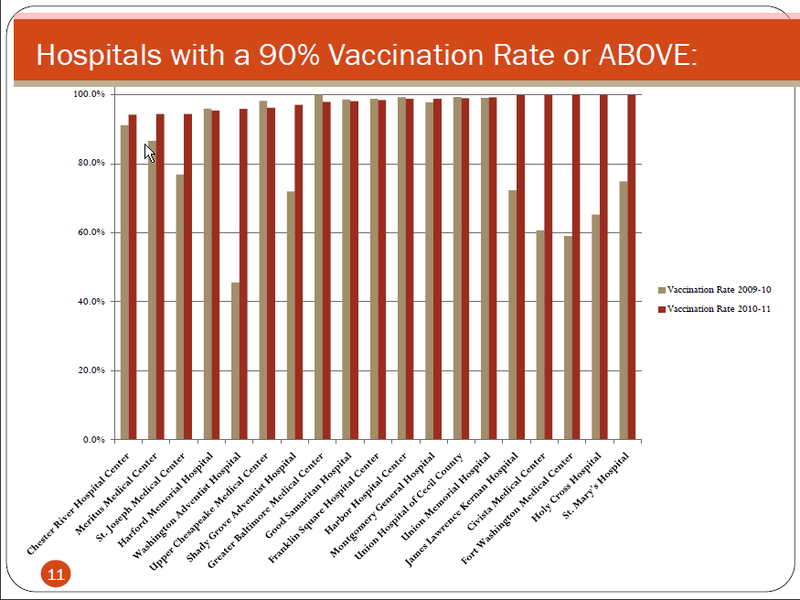 Clearly, there is significant room for improvement at these hospitals when it comes to protecting their patients from influenza. 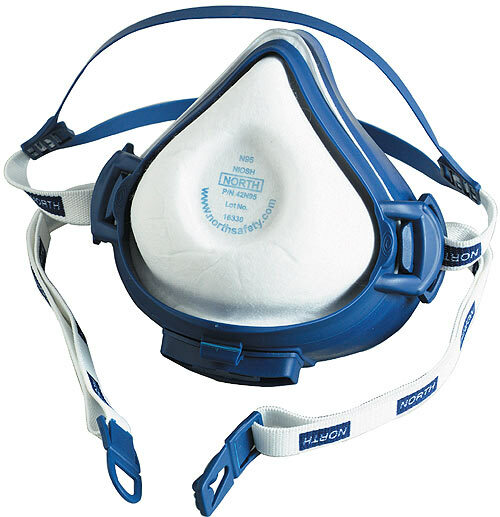 If an employee is not willing to either get the shot or wear one of these masks, then it is fully within the hospital's rights to take corrective action, up to and including termination of employment. An employee that does not put the patients first and foremost is an employee that is not doing their job. This is just a sampling of data. Although it might not be truly accurate, it does give some sense of how hospitals are doing in preventing the spread of the flu. If you work at a hospital, do your duty: get immunized or invest in a mask. Great as always, Todd. Thanks. 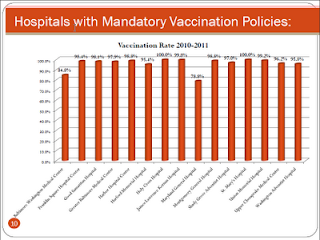 "Some may argue that hospitals have no right to force their employees to be vaccinated. Well, yes and no. Their job is to ensure the safety and health of their patients, and part of that is preventing infection wherever possible. Those who disagree with that are clearly working for the wrong place"
I suspect there will always be though who argue the right to choose etc. But those who would do so in the context of working in a hospital, and therefore necessarily in close contact with both vulnerable and contagious people, need to understand that it's just another form of elementary hygiene, like washing hands or wearing clean scrubs. Yep. And there are other vaccinations which hospital workers (or at least those who have direct patient contact) are required to get, such as Hep A, Hep B and Hep C. This is for their own protection as well as for the protection of other patients. Seems to me that this is on par with requiring surgeons to use scalpels instead of kitchen knives, even if their ginsu is great at cutting tomatoes. As they say, your right to punch ends at the tip of my nose. I don't want to die from a healthcare worker's celebration of personal liberty. Thanks for your comment. Over at Respectful Insolence, you mentioned you are a cancer patient. On average, when you go in for a single treatment, about how many hospital staff (including non-medical personnel) would you say you come into contact who are not directly involved in your treatment?